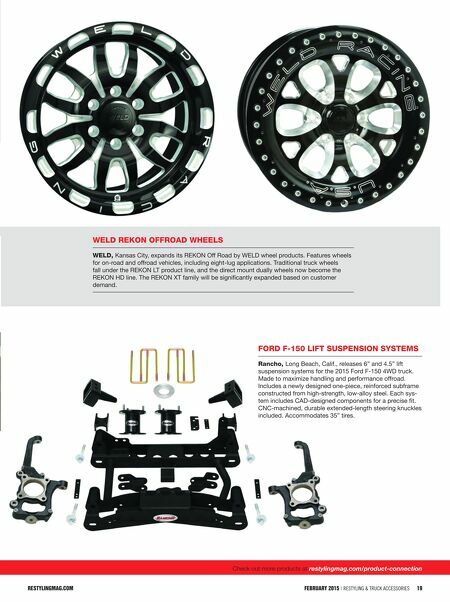 restylingmag.com FEBRUARY 2015 | Restyling & tRuck AccessoRies 19 Check out more products at restylingmag.com/product-connection weld rekon offroad wheels weld, Kansas City, expands its REKON Off Road by WELD wheel products. 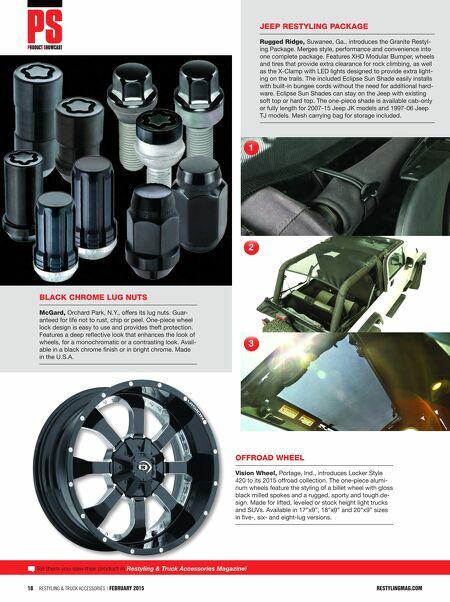 Features wheels for on-road and offroad vehicles, including eight-lug applications. Traditional truck wheels fall under the REKON LT product line, and the direct mount dually wheels now become the REKON HD line. The REKON XT family will be significantly expanded based on customer demand. ford f-150 lift suspension systems rancho, Long Beach, Calif., releases 6" and 4.5" lift suspension systems for the 2015 Ford F-150 4WD truck. Made to maximize handling and performance offroad. Includes a newly designed one-piece, reinforced subframe constructed from high-strength, low-alloy steel. Each sys- tem includes CAD-designed components for a precise fit. CNC-machined, durable extended-length steering knuckles included. Accommodates 35" tires.